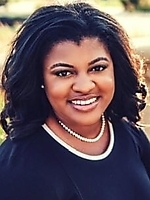 Info Deidre DeJear has dedicated her career to community and small business development. In 2008, on the brink of the recession, Deidre found her affinity for working with small business and building relationships in the community. She began her own small business, Caleo Enterprises, which provides entrepreneurs affordable marketing tools and business strategies. As the sole-founder, Deidre’s work has impacted over 150 small businesses and nonprofit organizations. Beyond her work as a business owner, Deidre is known for paying it forward and driving positive change in the community. In 2005, Deidre co-founded Back 2 School Iowa, a non-profit dedicated to collaborating with communities and corporations in order to provide resources to inspire youth in continuing in their education and build their future careers. This small organization impacts more than 3,000 Central Iowans annually. Deidre believes small businesses are the backbone of our economy. They are integral in providing diverse products and services and key to adding culture in our communities. There are over 260,000 small businesses in the State of Iowa alone. Those businesses provide jobs for nearly 40% of the workforce. Not only are they providing for their families, but they are strengthening our economy. As Secretary of State, Deidre will ensure our voter process is secure, accessible and fair for ALL Iowans - meaning rural and urban, young and young-at-heart, those with disabilities, people with money and people without. And she will do that with the utmost integrity. Deidre believes that if we are to protect our democracy, ALL Iowans need to have a voice at the ballot box.